g a 30min train waiting time. Another quickest and a little costly transport option is to book a Paris airport taxi. It will take a minimum of 40mins to travel you from CDG airport to Disneyland Paris via booking a Paris airport taxi. You will be charged as per the taxi meter covering the distance. The total price you will have to pay to ride a Paris airport taxi is around 70 euro in a single way travel in daylight. However, the cost to ride a taxi at night may cost you around 90 euros. is not only economical but also guarantees you a safe ride to Disneyland Paris from Charles de Gaulle airport is to book a magical private shuttle bus service. The ticket from Charles de Gaulle airport to Disneyland Paris costs around 20 euro and will take around 90mins to reach Disneyland straightway. Booking a taxi service from a reliable source to start your travel from Charles de Gaulle and end it at Disneyland Paris is one of the easy and quick ways to travel. It takes around 40mins approx to complete the journey from CDG airport to Disneyland Paris. Your journey will end directly at the gates of the Disneyland – world of magic. When you book a taxi service to go to Disneyland from Charles de Gaulle airport, you will not be charged a flat rate fee. Instead, you will be charged as per the distance covered and the rate is shown by the taxi meter. The estimated cost to book a taxi service from Charles De Gaulle airport to Disneyland Paris is 70 euro in the day and 90 euro if you ride at night. After the first four passengers, some taxi service also adds a supplementary charge of 4 euro per person. 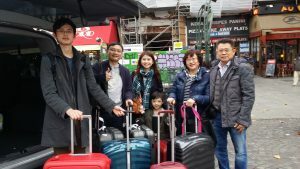 After a long hectic flight, if you are traveling with family; then it is obvious you want to travel to your destination without waiting for your transfer. Taking a taxi service, in that case, is one of the most convenient ways to travel from CDG airport to Disneyland Paris. The TGV train facility is known for its high-speed traveling capacity. The train can take you from Charles De Gaulle airport to Disneyland Paris in a fraction of minutes. The entire journey time will be only 45mins along with an average wait of 30mins. There is also an indirect RER train available from CDG airport to Disneyland; however, you’ll have to change from one RER train to another in the mid-way at Chatelet Les Halles Station. For a one-way trip, you will have to pay around 17.50 euro per person whereas children below 3years will remain out of charge and can travel for free. TGV trains have their own special platform build across the country and remain at one level below the ticket station at Terminal 2. Taking the TGV train to go Disneyland Paris from CDG airport is the most popular transfer options for a reason. The journey time is fast and the tickets are affordable to bear. However, they are not frequently running 24/7 and you need to wait up to 90mins if you miss catching your ride. Want to ride in style from Charles De Gaulle airport to Disneyland Paris? Book a comfy, luxury, and affordable private shuttle bus. A shuttle bus will hardly take 90 minutes from CDG airport to Disneyland Paris. The fare is also less that can suit every pocket. Tickets cost in a shuttle bus is around 20 euro. So, you can easily spot your ride from the sparkle graphics and bright color paint. Children below 3 years of age can ride free with a private shuttle bus. Get to the Terminal 2 to board your train. In every thirty minutes, a shuttle bus picks up travelers from Charles de Gaulle airport to Disneyland Paris; therefore, there’ll be no hassle to go into these luxury vehicles. Next Post Guide to Help You for Adventurous Choices! How to Start Your Journey to Paris from Gare Du Nord?